On Saturday I was lucky enough to get to go to London Fashion Weekend, with my lovely friend who agreed to fly 400 miles from our hometown of Edinburgh to go with me and indulge my fashion addiction. Our tickets were from 1.30-7.00, with designer catwalk tickets for the 6.30 Julien MacDonald show. 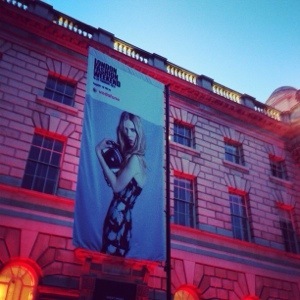 The venue was the beautiful Somerset House, home of LFW, just a short walk from Temple underground station. It was a beautiful day on Saturday, blue skies and even warm- we were so lucky with the weather! We arrived at Somerset House just after 1.30 and joined the queue to pick up our tote bags. We had booked silver level tickets, which included a tote bag with goodies. We didn’t have to wait long to pick these up, as the queue moved pretty quickly and the staff were organised, which was great! We then picked up our lanyard passes and that was it… We were in! First order was then of course to have a good look at our tote bags and goodies, and to grab some lunch before we got down to shopping! We made our way to the little cafe in Somerset house, waited in the humongous queue for food, paid £8.50 for a sandwich & lemonade (!) and sat down to have a good look at our goodies! 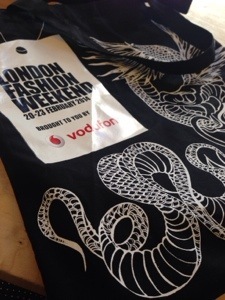 The tote bags this year were designed by Julien Macdonald, a black tote with a white dragonesque design. Inside we had an Essie nail polish in ‘naughty nautical’ (a nice turquoise), babylips lip balm, some lavazza coffee (they were a sponsor) and various other bits and pieces- like a beauty bar. There wasn’t much in it, but I was pretty happy to see the nail polish and lip balm! Our next point of call was the Vodafone Lounge, where some brand were there to ‘shop the catwalk’. 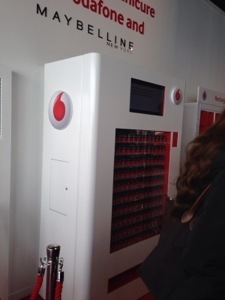 We also went in to the VIP Vodafone area, and thanks to being a Vodafone customer I picked up my free limited edition nail polish out of the very cool nail polish vending machine – I need one in my house!!! You could also book in to get a manicure & there was a recharging station, which was a nice addition. I won’t go in to my purchases in detail but lets just say… I didn’t spend much! I did fall in love with a Roberto cavalli clutch bag but for £49 and the fact that it was so tiny that I wouldn’t have even been able to fit a bank card or my iPhone in it, I couldn’t justify the expense! 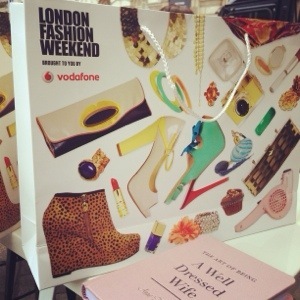 I did buy a book to add to my fashion book collection, a tongue in cheek reference to my upcoming wedding ‘the art to a well dressed wife’ and some maybeline nail polishes and lip sticks. Coming out at just under £20 for all of these purchases- I was patting myself on the back for being so well behaved! The truth is the choice was really.. Spend HUNDREDS, or spend very little, so again the upcoming wedding kept me on the straight and narrow. I did really enjoy having a good look around the shopping areas, and we happily whiled away a good few hours doing so. There were also some stands amongst the shopping areas, such as the ‘Bueno lounge’ where you could book in for a massage and pick up free kinder Buenos- yum! This post is getting far too long so I’ll talk about the catwalk show in my next post! How fun for you to go to Fashion week! It was so much fun! I would definitely recommend it!